Bangladesh beat New Zealand by 5 wickets in their final group match in ICC Champions Trophy 2017 and kept their hope alive for semi-final. Now the match between England and Australia will decide who will be the second team from Group A to qualify for semi-final. After winning the toss New Zealand skipper Kane Williamson chose to bat first at Cardiff. Taskin gave the first breakthrough for Bangladesh by picking up the wicket of Luke Ronchi on 16. Rubel Hossain got rid of Guptill on 33. Williamson’s run out on 57 broke the 3rd wicket partnership of 83 runs between him and Ross Taylor. Taylor was finally gone after scoring 63. Taskin was the wicket taker. Then some brilliant death bowling display from Bangladeshi bowlers thanks to Mosaddek Hossain’s 3 wickets helped Bangladesh to restrict New Zealand for 265 for 8 in 50 overs. Mosaddek claimed his career best 3 for 13. In reply Bangladesh had a terrible start as they lost opener Tamim Iqbal in the second delivery of the innings. Soon Bangladesh lost Sabbir Rahman, Soumya Sarkar and Mushfiqur Rahim in a quick succession and were in all sorts of trouble on 33 for 4. But Shakib Al Hasan and Mahmudullah had other idea. They made 224 runs partnership in the 5th wicket which is highest for Bangladesh in any any wicket in ODI’s. Shakib was gone after scoring 114 when Bangladesh needed only 9 runs to win. Mosaddek hit the winning shot as Bangladesh sealed a historic 5 wicket win with 16 balls remaining. 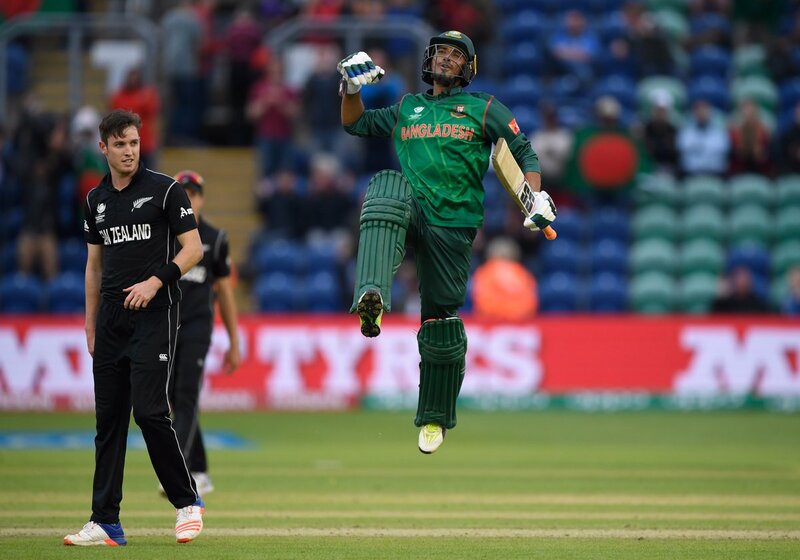 Mahmudullah remained not out on 102 off 107 balls including 8 fours and 2 sixes. Tim Southee was the most successful bowler for New Zealand with 3 wickets for 45. Shakib Al Hasan was adjusted as Man of The Match for his match winning knock of 114 runs from 115 balls.